This Bluebird appears to have been through a fire and then filled with crap. 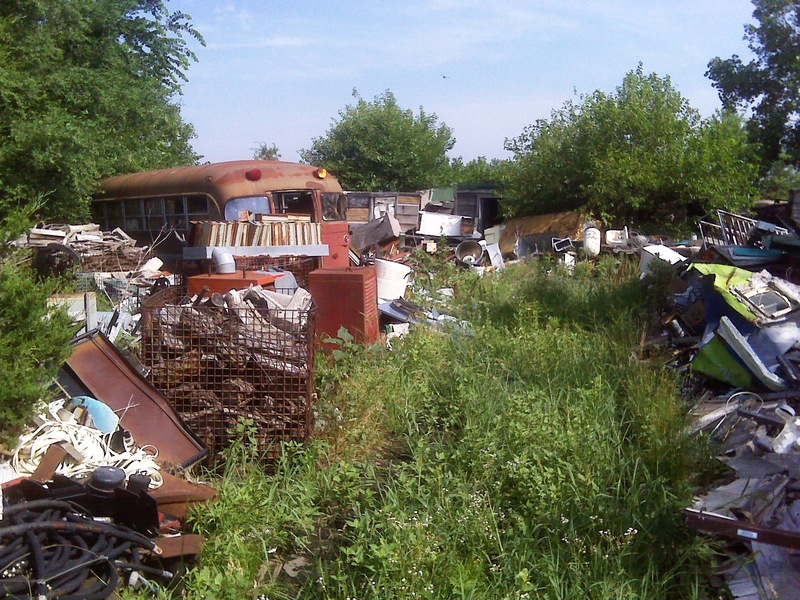 The amount of random garbage inside reflects the amount of random garbage throughout the junkyard, which is why I call it a junkyard instead of a proper salvage yard. 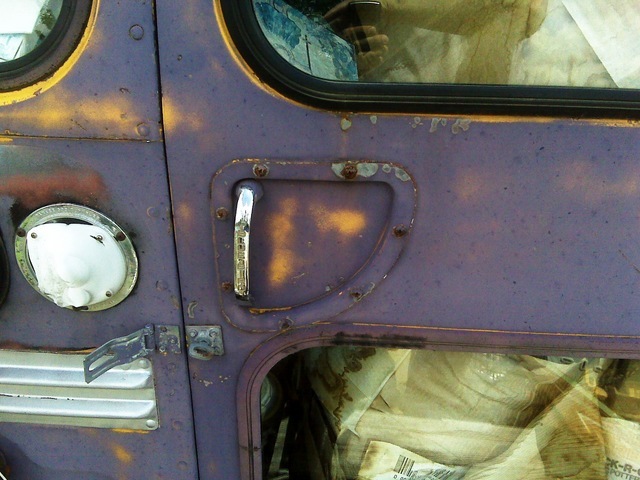 The door handle says “Bluebird” on it. I’d probably replace the Phillips screws with carriage bolts so it wouldn’t be so easy to dismantle from the outside, and I’d intend to add a lock of some sort. The deadbolt mechanism has a big red safety handle on it. I expect I could rebuild this with something more, shall we say, subtle, while retaining the ease and obviousness for exit in a real emergency. Saturday morning Jonathan and I headed back to the junkyard to bring home a door. 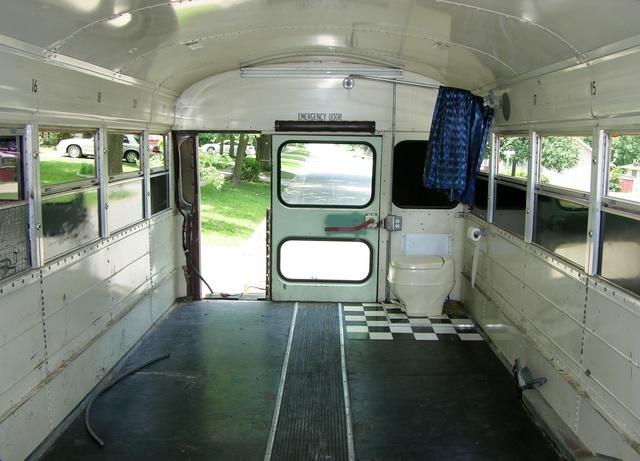 After a quick measurement showed that the door I’d already found would fit my bus, we wandered around for an hour looking at all the wondrous crap and searching for other donor buses. Here’s a little bit of the flavor of the better-kept parts of the junkyard — an actual path with waist-high weeds, random stuff, and a glorious vintage bus that would regrettably require reconstruction more than mere restoration. Bowling trophy? Hardly. That’s a 40-gallon steam-jacketed tilting kettle. By way of perspective for the size of this thing, that’s a wringer washing machine to the left and a lawnmower-size engine to the right. The kettle lists for $26,000 and can be had for $12,000 used. The full set of technical specifications from the manufacturer is available as well. 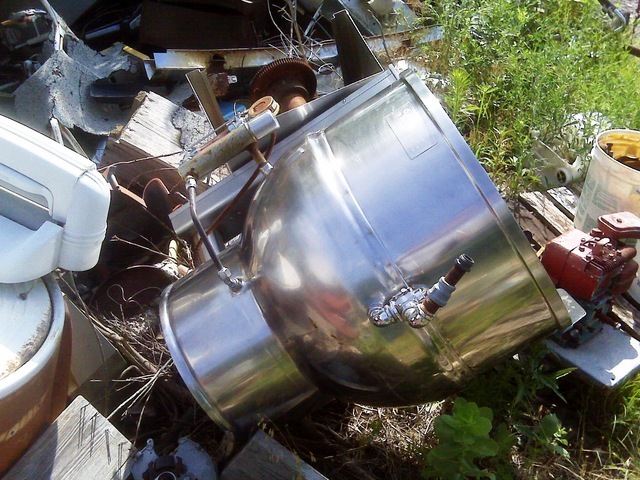 This particular kettle is missing the rolling stand and the gauges and hoses are corroded and weathered, but the stainless kettle itself is immaculate. It might be hard to press back into service in a commercial kitchen, but Lawrence’s wife is interested in it for a dye vat for her fiber arts. I’m guessing when I go back, Lawrence will come along to negotiate. 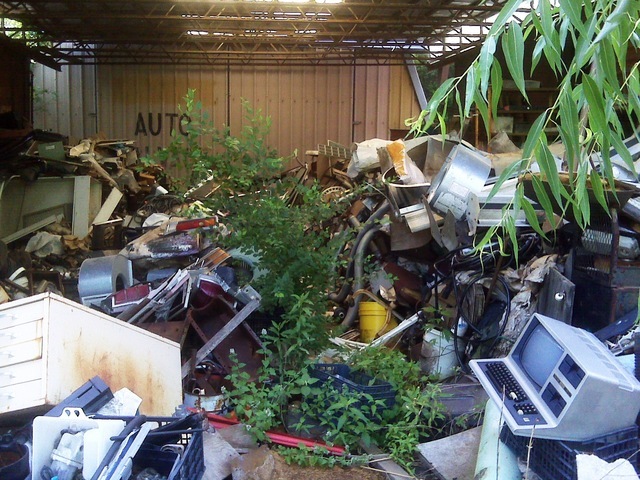 Here’s the junk barn in the junkyard. Anything here look familiar? 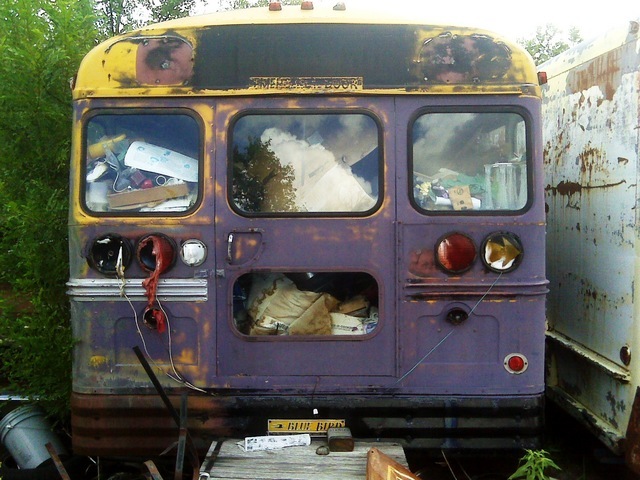 We weren’t able to find any more Bluebird buses, so we returned to the yellow, purple, and soot-colored one I’d already found and removed the door. It was so warm out that our hands were too sweaty to get a good grip on our (good) screwdrivers, so we had to use the cordless drill to take out all the Phillips screws holding the hinge. I expect I’ll replace them with (real) rivets or carriage bolts as well. I paid $100 for the door. Whoever reworked the door took the chrome handle that I think one uses while climbing in the emergency exit and welded it above the new doorrampstairs — I’m not quite sure why. At any rate, it interferes with the placement of a proper door, so Jonathan and I took turns cutting it off and grinding down the welds. Here’s the new door set in place. It’s a good fit! It sat a little cockeyed because the hinge hangs below the bottom of the door, but it’ll mount straight. From the inside, it already looks so much nicer than the wooden steps mounted to the current door. I hadn’t thought I cared about having windows out the back and I had planned to leave the (future) bathroom door(s) closed most of the time; but this view makes me think I should plan things so the bathroom door(s) can stand open while not in use. I love this! My brother and I looked over the remaining framework and the welding that was done to convert the door. 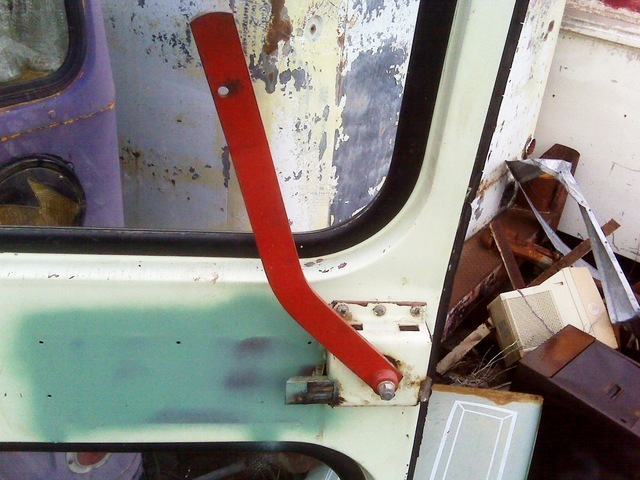 I need to do some further examination, but our direction is that it may be easier and give a better result to go back to the junkyard and remove the entire rear corner from the salvage bus, cutting ribs to replace what was removed from mine and leaving factory-formed sheet metal still riveted to the ribs wherever possible. That’s going to be a chore. 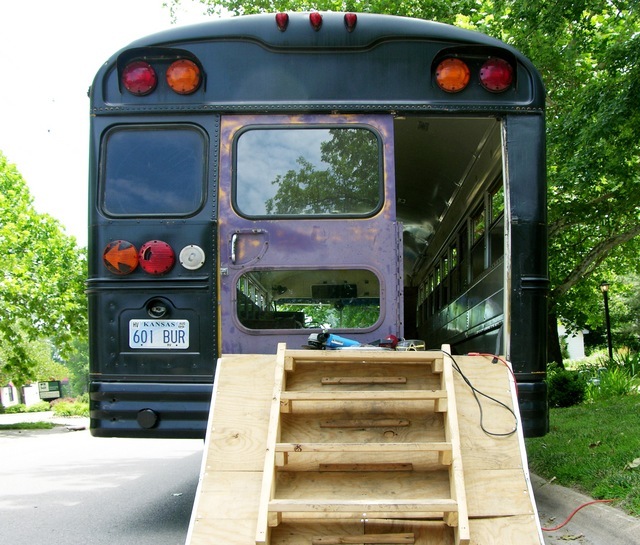 Should have bought a bus that didn’t come pre-stupided. This entry was posted on Tuesday, July 14th, 2009 at 7:32 pm	and is filed under Expense, Mechanical, Security. You can follow any responses to this entry through the RSS 2.0 feed. You can leave a response, or trackback from your own site. Thanks for this Blog. I subscribed to your RSS feed in Google Reader and everytime you have something new I read it instantly. Watching the bus being restored is awesome, the bus really grows on you. I’m always really excited to see what you came up with this time… and I’m looking forward to find out what the End-product will look like some day! That computer in the junk barn looks nice, probably wouldn’t work after being outside so long (and I’d probably never get it to work either), but it looks pretty intact. That’s the type of thing I just couldn’t let go if I went to that junk yard, where is it by the way? after a hunch and a quick google image search I’ve found that the computer is in fact a trs-80 model III, now I’d really take it. Evan, the junkyard is on highway 50 between Newton and Walton, and the junk barn is accessible from the path to the antique bus which is in turn accessible from … actually I don’t quite remember how to get to it. We’ll have to do a little rediscovery if and when we go back. 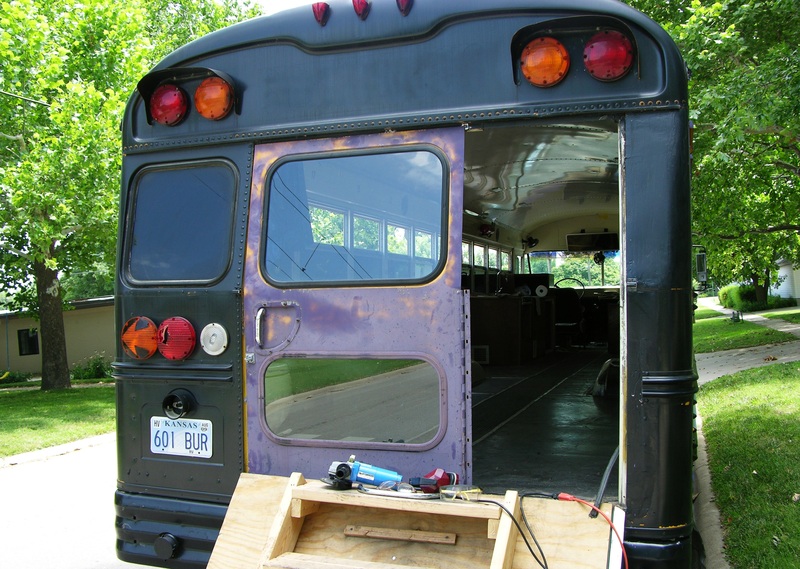 Every other part of this bus needs work or replacement. The thing runs and the engine overhaul seems to be the easiest to take care of. 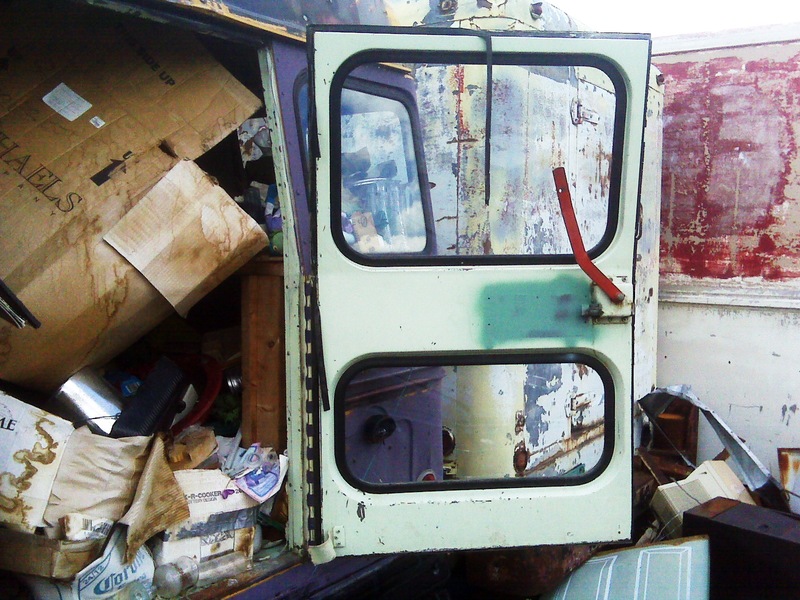 Alesa, my best bet would be a local salvage yard. 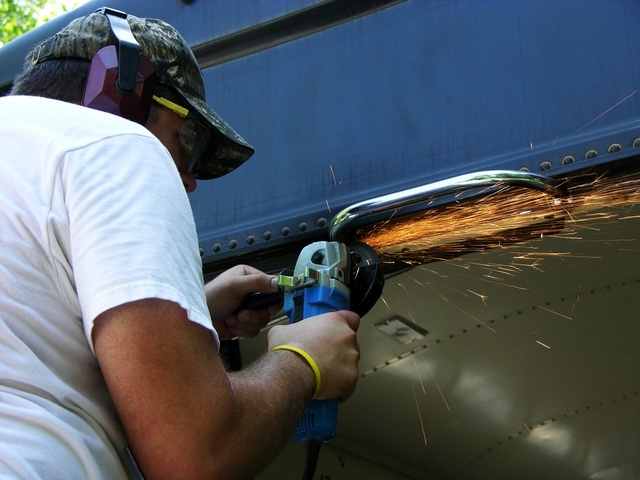 Just know that it’s going to be a lot of work removing seats — from what I read on other projects, the bolts are often rusted on and most people tend to grind them off. You may want to take a generator to the salvage yard to make quick work of getting the seats free. 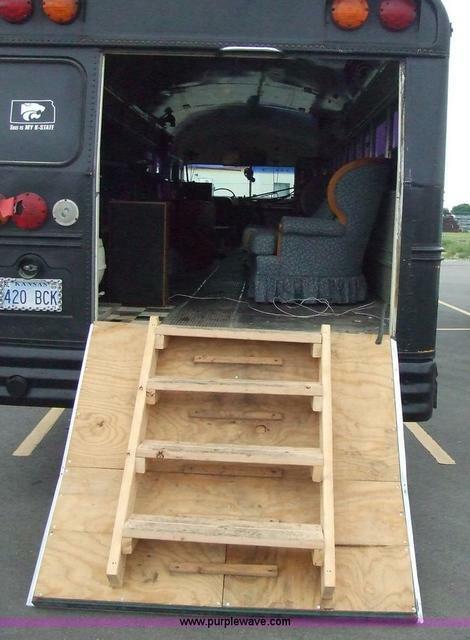 Also, make sure that the seats will actually fit and mount in the new bus. My bus had one end of the seats supported by a ridge on the wall; you’d want to be sure that lined up properly between your seats and your bus.